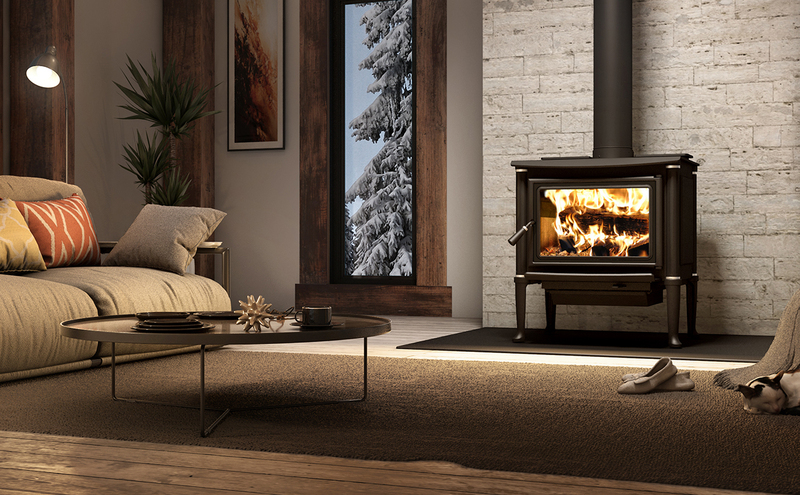 Introduced on the market in 2018, the Harmony leaves no one indifferent with its look reminiscent of cast iron appliances, while offering the many advantages of wood stoves made of steel. The detail of the unique Roman Doric columns with grooves engraved on the steel provides great elegance. Largely meeting EPA requirements with emissions below 1.54 g/h, the Harmony is an eco-friendly appliance that easily complies with the most stringent North American requirements. Available with a refined black or silver door trim, this unit becomes a serious choice to consider. Installation in a mobile home is allowed and you can add an air supply to the combustion to meet the requirements of domestic energy sources. Its 2.3 cubic feet combustion chamber makes the Harmony a generous source of heat for your home that will certainly meet your highest expectations. Glass surface – dimensions (Width X Height) 16 1/2" X 10 1/8"
Overall dimension (Height) 30 1/8"
Overall dimension (Width) 25 5/8"
Overall dimension (Depth) 25 5/8"
Door opening - dimension (Width) 17 1/2"
Firebox – dimension (Depth) 17 1/4"
Steel thickness – top 3/8"
Clearance – back wall 14 1/2" 6" 11" 6"
Clearance – placed in a corner 12" 12" 12" 12"
Clearance – side wall 22" 22" 22" 22"
Clearance – top (measured from the platform on which the appliance is installed)** 84" 84" 84" 84"
There are two types of chimneys: an insulated (or prefabricated) chimney or a masonry chimney. If you have a masonry chimney, it must meet the local building code. It must be lined with refractory bricks or tiles joint together with refractory cement. The chimney diameter should be the same as the appliance’s flue outlet (6 inches for most models). It is rarely the case with masonry chimneys. Their diameter is often bigger than the appliance’s flue outlet. The way to deal with this is to insert inside the masonry chimney a stainless steel liner that has the same diameter as the appliance’s flue outlet. Unless a liner is installed, serious draft problems can occur. Solution#1: The chimney may simply be too cold. Light-up a small quantity of newspaper in the appliance, as close as possible to the flue outlet. Leave the door slightly ajar. This small fire will slowly heat-up the chimney, until it is hot enough to create a normal draft inside the exhaust system. If needed, slowly increase the quantity of newspaper. When you realize that smoke is being evacuated normally through the exhaust system, you can build a normal fire. If your chimney runs along the outside wall of your house, it is possible to cover it up in order to protect it from the wind and the cold. A covered chimney will heat-up faster. Solution: Make sure you use good, seasoned wood. The wood you burn plays an important role in the overall performance of your heater. Your wood should have been properly dried for about one year. Furthermore, it is better to use hardwood, such as oak, maple, beech, or ash. For the same volume, hardwood will produce more heat. Storage is also very important. Wood that has been cut for one, two or even more years, will not necessarily be dry if it has been stored in poor conditions. Under extreme conditions, it may have rotted instead of drying. Smaller pieces of wood will dry faster. The wood should be stored in a place where the grass is not too long, and where the wind will be able to circulate between the logs. A 12-inch gap should be kept between the cords. The wood should be placed in the sunniest area and should be protected from the rain and snow on top, but not on the sides. Use a moisture reader to measure the moisture content of your wood. Ideally, it should be below 25%. Solution #4: Your exhaust system may be too restrictive or may lack a sufficient rise. Ideally, your exhaust system should not have more than one 90° elbow. Furthermore, all horizontal sections should be as short as possible and have a minimum slope of ¼" per foot. If you have verified all the points mentioned above and your heater works fine, but still does not produce enough heat, you may be asking for more than what your appliance can realistically give you. Stoves, fireplaces, and inserts are used for "zone heating”. It is normal that the heat is distributed unevenly inside your home. It will always be colder in the rooms that are distant from the heater. Furthermore, since heat rises, a heater located at the ground-floor level will not heat your basement. Solution 6: It is possible to increase heat circulation between the floors by installing floor traps. The location of your heater is also important. Try to install it in a central location. If you want to heat both your basement and the ground floor, install your heater in the basement. The heat will rise to the upper floors. Verify that the area you try to heat respects your appliance’s heating capacity. Your appliance’s heating capacity can be found on the printed literature, in the owner’s manual, or in the technical data section on our web site. Keep in mind that your appliance's heating capacity assumes optimum conditions. It may be too low in situations where a house is poorly insulated, or highly exposed to wind. If you already have an appliance with a high heating capacity that works normally but does not heat enough, you probably need a central heating system, such as a warm air wood furnace.